3D printed weapons raise legal and security issues. Indeed, 3D printing weapons is illegal in Europe, Australia and parts of Asia. Hence, a person could potentially easily turn into a new kind of gun manufacturer with only a desktop 3D printer. Advanced customization and low production costs are among the advantages of 3D printing for making firearms. Note that it is possible to 3D print gun parts such as the magazine or the handle. 3D printing the most important parts like the chamber or the barrel is a challenge. Indeed, they need high resistance to heat and explosion. The most credible option for homemaking a gun is by crafting a lower receiver like demonstrated in the Wired video. The machine capable to turn an aluminum block into a gun parts is a lot closer from a milling machine than a 3D printer. To prove their expertise, some companies like Solid Concepts made metal 3D printed guns. This technology is far too expensive and complex for individuals nowadays. 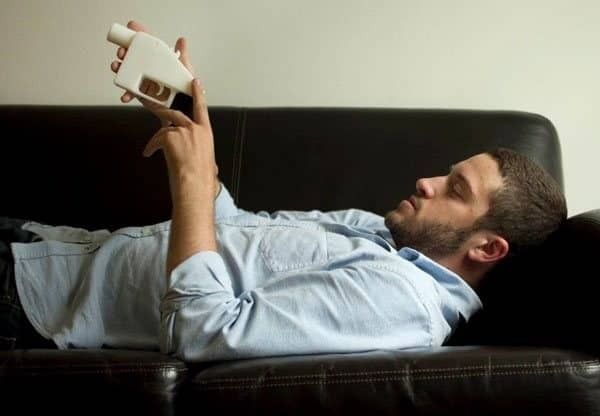 In May 2013, the first 3D printed gun was test-fired by Cody Wilson. This plastic pistol was produced by internet activists Defense Distributed under the name ‘Liberator’. The Liberator .038 is made out of 3D printed ABS, with the exclusion of a single nail used as the firing pin. In August 2013, a Canadian man going by the name “Mathew” 3D printed an actual rifle, a Grizzly .22 Caliber Rifle model. In September 2013, Hexen organization produces the Reprringer Pepperbox .22 Revolver. The weapon can hold 5 bullets at once in its 3D printed barrel. In May 2014, Yoshitomo Imura 3D printed and fired a Zig Zag .38 Revolver. He was later arrested and convicted for owning four 3D printed plastic pistols at his house. In July 2014, a US citizen nicknamed “Buck O’Fama” 3D printed a receiver for a semi-automatic .22 Ruger Charger pistol. The Ruger Charger accepts high-capacity mags holding 30 rounds or more. It is capable of shooting a full magazine without issues. In September 2015, a college student named Chris, 3D printed a semi-automatic revolver called the ‘Yoshee Six Shooter.’ The Yoshee Six Shooter is a revolver style weapon that has multiple barrels and can fire multiple shots without reloading. It includes a 3D printed grip, hammer, spring, barrel and barrel holder. A metal screw is used as a firing pin to strike the rim of the bullets. In November 2015, an engineering student called James Patrick has built a 3D printable revolver that uses a rubber band and a nail to fire .22 bullets. The revolver called PM522 Washbear can hold six or eight bullets and can shoot them in a row. This is not the first 3D printed gun made by Patrick who also made a previous model (single shot) called the Songbird. In November 2013 Solid Concepts, now a Stratasys brand, 3D printed an operational metal gun. The Browning 1911 Metal Replica fired more than 600 bullets without any damage to the gun. 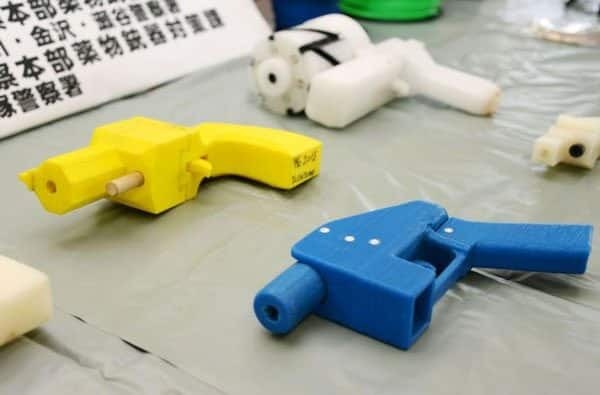 Seized 3D printed plastic handguns displayed at Kanagawa police station in Yokohama, south of Tokyo, after Yoshitomo Imura’s arrest in 2014. In May 2015, a man nicknamed as Derwood, 3D printed the ‘Shuty’, a 9 mm semi-auto based on a combination of parts from a standard AR-15 and a P.A. Luty. The design for the Shuty combines a metal bolt, an AR fire-control group and the barrel of a Glock. The magazine, bolt carrier, upper and lower receivers are all 3D printed. In January 2016, the now famous Derwood, 3D printed a new gun of its design, the ‘Shuty MP-1’. This 3D printed gun is a 9 mm semi-automatic pistol made from 95% 3D printed parts. However, the remaining components and most complex parts of the 3D printed gun are made of metal: store-bought Glock barrel, hammer, firing pin, bolts, and springs. Derwood has been able to shot more than 600 hundred cartridges with his Shuty MP-1. According to him, the plastic holding the barrel starts to melt after about 18 shots so it is better to let the gun cool off regularly. 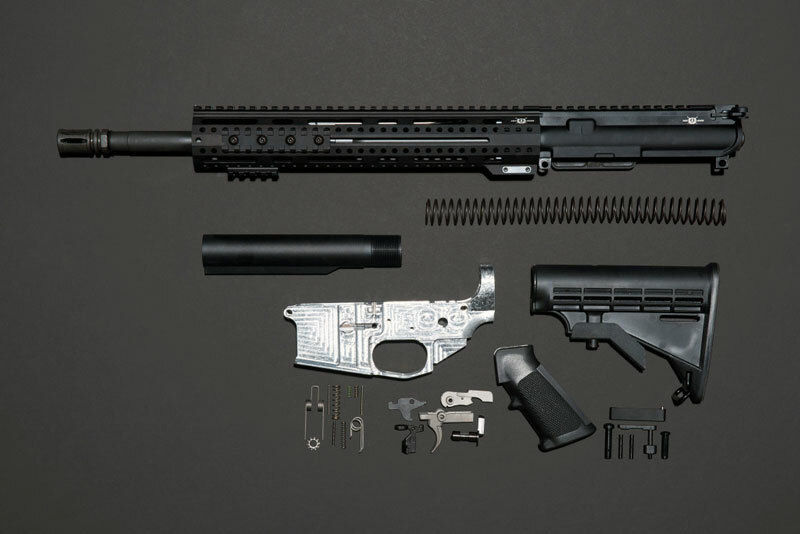 Components of the AR-15 ghost gun made by Andy Greenberg, including the homemade lower receiver. Most of gun parts (magazine, pistol grip, upper receiver) can be bought online without any tracking records. But the receiver stands one of the most complex and important parts. The Ghost Gunner by Defense Distributed is a CNC milling machine capable of making AR-15 lower receivers. The AR-15 is like an AR-10 but uses smaller components for firing 0.223 caliber bullets. Like other CNC mills, the Ghost Gunner uses a digital file to carve objects out of aluminum. The Ghost Gunner produces an unserialized AR-15 lower receiver from a pre engineered aluminum part (called 80 percent lower) in a few hours. In 2013, the UK Home Office introduced stricter regulations on 3D printed guns and 3D printed firearms, making it highly illegal to create, buy, or sell them or 3D printed gun parts in Great Britain. In November 2015, the parliament of the state of New South Wales, Australia, passed one of the strongest prohibition law against 3D printed guns. This law called Firearms and Weapons Prohibition Legislation Amendment Bill 2015, intends to penalize both physical and digital possession of 3D printable guns the same way as any illegally owned firearm holder. More information can be found in this 3D printing Industry article. California passed a law in July 2016 requiring anyone who makes or assembles a homemade firearm to apply for a serial number or “other mark of identification” from the state Department of Justice. Around Asia, notable laws on 3D printed guns include Singapore, where possession of a 3D printed gun is punishable by death. In 2017, China introduced the Chongqing regulation which required manufacturers involved in 3D printing to register with the government to help prevent 3D printing technology being used to produce illegal items (including blueprints) such as firearms. As of 1st August 2018, Defense Distributed is again allowed to publish designs for 3D printed guns after the US Department of State agreed to waive its prior 2015 restraint order against Cody Wilson and Defense Distributed. Therefore individuals are allowed to freely publish designs and other technical files about 3D printed guns in the United States.